LOGO OF THE YOUNG CIVILIANS: Under a pair of comfortable sneakers reads, "The Young Civilians Are Not Comfortable." 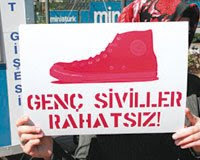 The Young Civilians (Genç Siviller), a name the group gave themselves after they staged a protest against Turkey's annual Youth and Sports Day, an event in which schoolchildren in sports uniforms march diligently in school stadiums across the country. The group objected to what it considered to be the festivities' dreary Stalin-like order. The neo-nationalist daily Cumhuriyet reacted to the protest with a headline that read, "Young Officers Express Concern." The group retorted online with an aptly titled counter-statement: "The Young Civilians Are Uncomfortable." Doing what they do best, the Young Civilians are in the middle of an innovative campaign to encourage President Gül to accept the invitation of Armenian President Serge Sarkisian to attend the first international football match to be played between the two countries—a match to be played Sept. 6 that will qualify one team or the other for the FIFA World Cup. Armenia has said that it will open up its borders from Sept. 1 to Sept. 6 to allow Turkish citizens to travel to Yerevan, the capital of Armenia where the game will be played (see Aug. 16 post). For their part, and in addition to raising pressure on Gül to accept Sakisian's invitation, the Young Civilians are encouraging Turkish citizens to take advantage of the historic opportunity and travel to Yerevan. The border has been closed since 1994 following Armenian support an armed insurrection by ethnic Armenians in the Karabakh region of Azerbaijan, a close Turkish ally. Gül has still not decided whether he will attend the match. On my last day in İstanbul, I had the opportunity to talk with Pınar Akpınar, the Young Civilian leading up this latest campaign of the Civilians. Akpinar's resolve to make a difference in the foreign relations between both countries was not only inspiring in its own right, but more so in that it fits within the Civilians' larger agenda of sparking political dialogue. According to Akpinar, for the Civilians, no progress can me made without first having people talk to one another in spite of their differences. This not only includes progress toward ending the current standoff between Turkey and Armenia, but most especially in Turkey's larger struggle for democracy. Long intrigued by the Civilians who claim "politics as existential," what most struck me about the stated objective of the organization was the non-ideological nature of its end-goal. Rather than a capitalist, socialist, secularist, or Islamist society, the Civilians are first and foremost concerned with "democracy," and democracy for the group means better democratic practice. More than free elections, democracy means freedoms of expression and assembly, in addition to freedoms to a broad education centered on the development of the individual and multiple opportunities to meaningfully participate in the process. To drive home their message of democracy being a process versus an end, the Civilians are open about not knowing exactly sure where Turkey's democratic project will end up—rather, like relations between Turkey and Armenia, what is important is that it gets a good start. For more on the Young Civilians, see April 9 post.